A reliable first class quality service, with exceptional customer experience. Five national UK depots with knowledgable local tranport managers to help you. Satellite tracked vehicles, delivered by our, trained, vetted, courteous drivers. Delivered to your desk or as required, not just to your door. Expertise in city deliveries. Pluscrates Logistics Services operate a modern fleet of liveried tail-lift vehicles which are delivering & collecting daily in Central London, Birmingham, Manchester, Bristol and Scotland from our depots in Wembley, Castle Vale, Trafford Park, Ashton Gate and Livingston, as well as to all major cities in the UK through our National Depot Network. 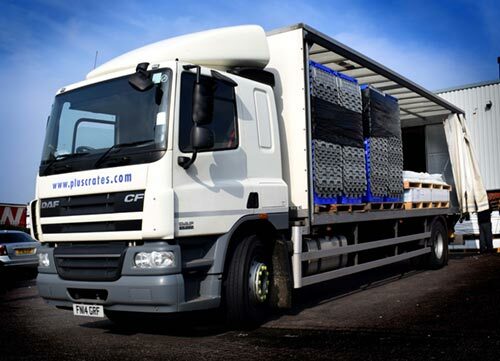 This means that we can offer you economical part loads, return loads, urgent same day or next day, timed, as well as regular scheduled deliveries. A reliable and First Class quality service. Our own uniformed, trained, vetted, helpful & courteous drivers. Items delivered, not just to your door, but to your desk or storage area as required. Satellite tracked vehicles with real-time information. Informative & knowledgeable local Transport Manager. Bespoke storage available at all of our 5 National Distribution Centres. A choice of 3.5 ton Luton Vans, 7.5 ton and 18 ton tail lift vehicles and porters.